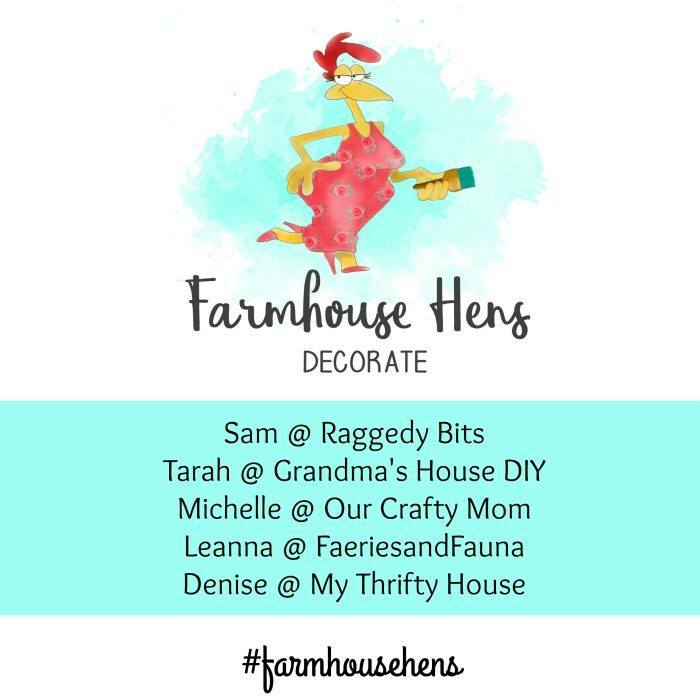 A post about my kitchen project in collaboration with four other AMAZING DIY bloggers: Farmhouse Hens Decorate! 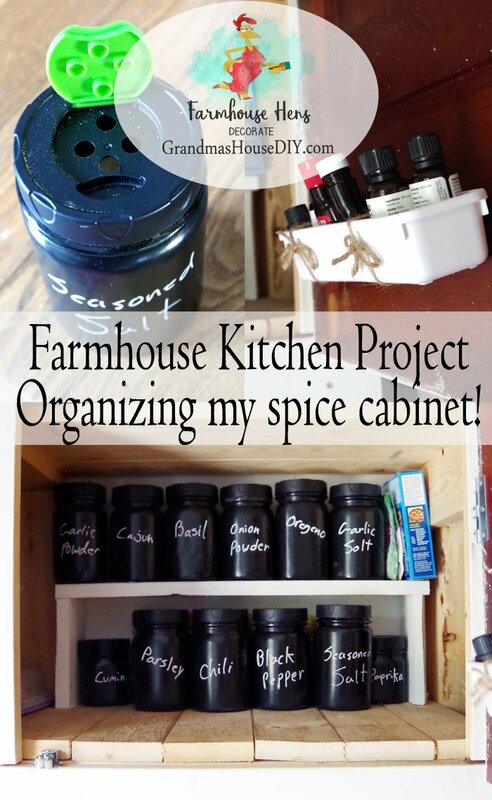 When I found out that our next post was to be a farmhouse kitchen project my mind turned immediately to my dreaded spice cabinet. Some of those plastic shakers have literally been with me for YEARS! Once I started buying bulk organic herbs and spices off of Amazon I kept refilling my old shakers until they gave out on me. So, one by one, I’ve been replacing them so my spice cabinet was becoming one very strange collection of pickle jars, olive jars, pepper jars and plastic shakers lol. (Yeah if its glass with a good top, I keep it!) It was definitely time for my spice cabinet to grow up and all of my plastic shakers to retire for good! I decided to replace everything I could with my Grandma’s mason jars and that led me to Amazon on the search for the perfect shaker lid. At first I was confronted by a very DIY thought, “Why don’t I just take a hammer and a nail and punch a bunch of holes in a regular mason jar lid to make it a shaker?” But then I decided that, “No, I really want to be able to close and SEAL them tight.” So these are the lids I found. Most specialty mason jar lids are rather expensive but these were only $13.14 for 12 lids! I was rather disappointed in the options out there – these really aren’t my color but they were the only thing available that I felt were also affordable – functionally though they work great and seal well! The larger containers means I don’t need to refill them near so often which is also really great because I’m short and I keep all of our bulk herbs and spices way up high in another cabinet. 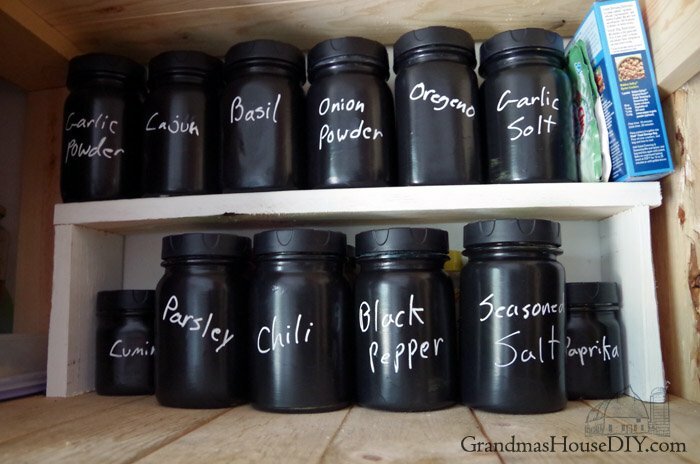 I always knew which was which with the old glass jars I was using (notice I have no labels on the jars of spices in the before picture) and that was fine for me but it meant my husband generally had to open three or four of them to smell before he found what he wanted. (Sorry Joe!) Oregano, basil and parsley look a lot alike lol So I needed to figure out some labels. I thought about buying sticker labels but that really went against my grain. 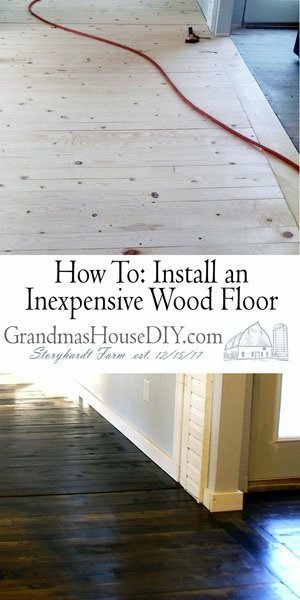 I wanted to do something that was DIY but simple and not terribly expensive. I’ve never worked with chalkboard paint before but I have always wanted to and this seemed like the perfect project! Another search on Amazon and I found this chalkboard paint for only $9! 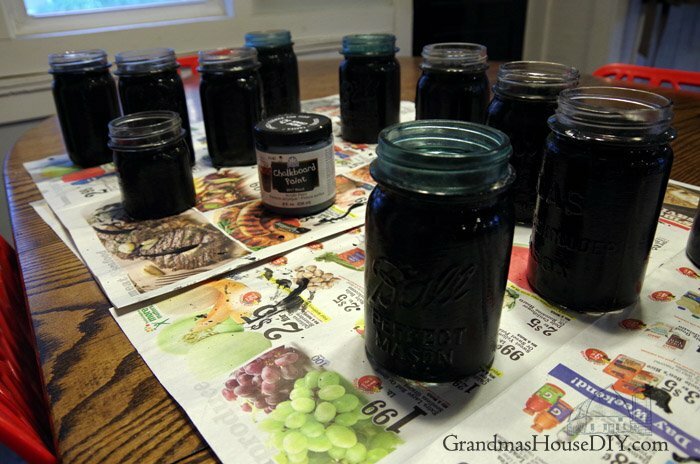 First I gave the jars a good hand washing (they really needed it after spending decades in the basement and the last couple of years out in the barn…) With them clean and totally dry I first tried to tape them off and create a rectangular label… total fail. I had expected a certain amount of bleed but my inexperience with this paint led to some serious problems. (My husband likened painting with this stuff as painting with snot.) Because its on glass it doesn’t matter how “light” a coat you attempt because inevitably, after a little while, it starts to clump and drip… like its alive! So Joe, after listening to my swearing for a few minutes, asked me, “why don’t you just paint them completely?” So I got my husband a brush and that’s what we did. 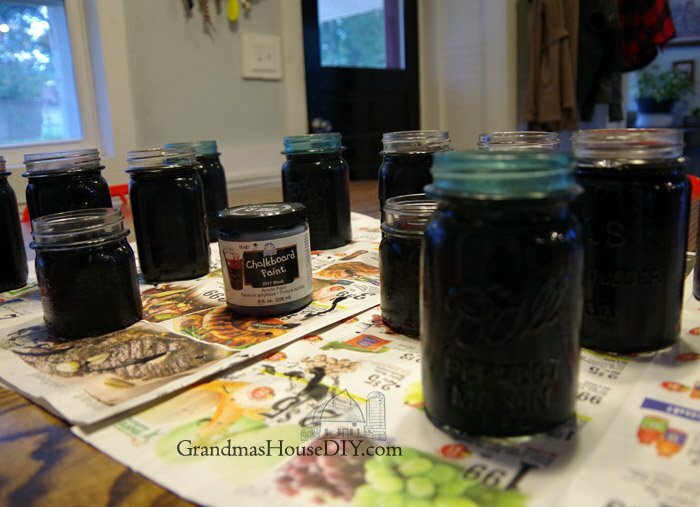 Did I wince really really really hard covering up those pretty blue jars? Yes I did. But I also knew this paint would come right off with a good washing so I’m certainly not ruining the jars! It took two coats. Can you believe I couldn’t find chalk at Walmart? Not even sidewalk chalk! This Chalk Pen was all I could find and though it wasn’t what I wanted it turned out to be a good thing. It was certainly easier to use then regular chalk and, with a little scrubbing it does come off especially if you misspell Oregano (ask me how I know). After that I got to fill my jars and throw out almost all of my old plastic spice containers! We do have several spices that I’m just literally using to get rid of them… so they didn’t get jars. But the twelve of our main spices did. Garlic salt, black pepper, seasoned salt, chili powder, cajun seasoning, paprika, cumin, oregeno, basil, parsley, onion powder and garlic powder. 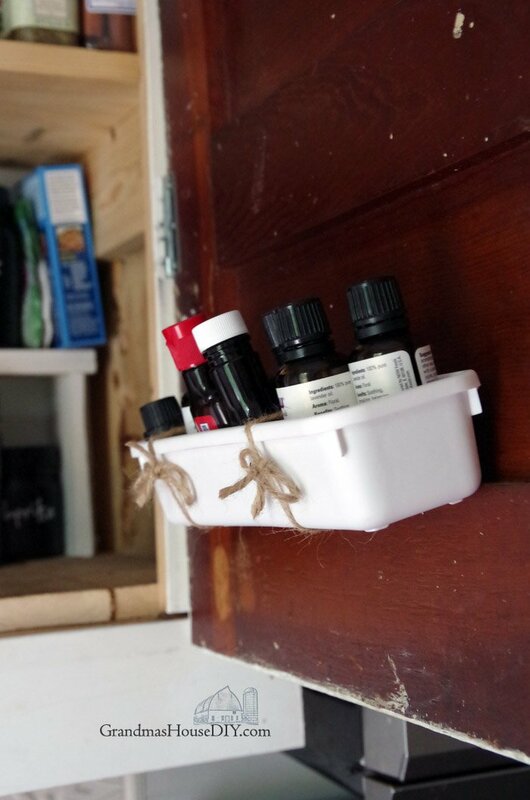 Last but not least I did one more thing that I’ve wanted for myself for a LONG time: a special spot just for my essential oils! With the organizing of my spice cabinet I ended up with a ton of room in there so I knew I could utilize the back of the cabinet door. A trip to our Walmart and I found a drawer organizer that turned out to be about the right size, I also purchased a couple of picture hooks. I hung them up with some twine and was way too proud of myself. This was one of those fun projects that is almost silly with how rewarding it is. Can a spice cabinet really make you happy and improve your life? Yes it can! All in I spent less then $30 and now every time I open my spice cabinet it makes me smile! Be sure and scroll down to see what the other bloggers did for their own Kitchen Projects! 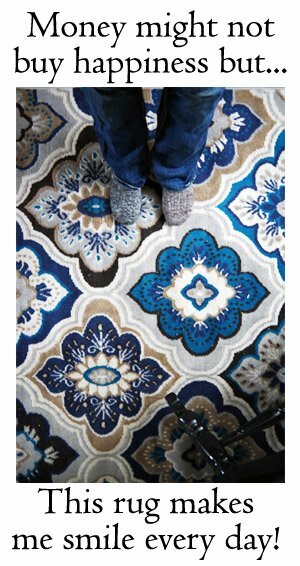 I am absolutely stoked to be a part of a group that contains SO many spectacular DIY bloggers! Can’t wait to see what we all come up with next month and share it here on the blog with all of you! Tarah….I love your grown up spice cabinet. 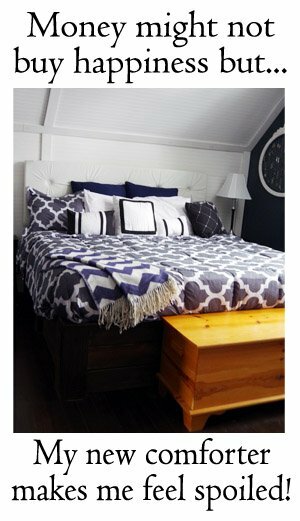 This is such a great makeover and I love that you were thoughtful about being thrifty too. Great job. 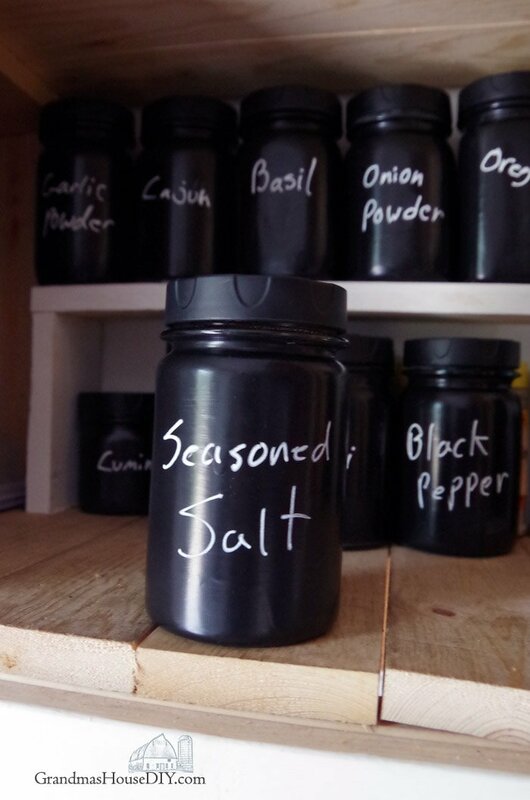 Chalkboard is the best for storing spices, because it makes them so easy to update. I love that these spice jars are large and you can see them all. I never thought of finding lids to fit mason jars, that’s brilliant. Thank you Leanna! My spice cabinet is so much nicer to use now because, like you said, I can actually see everything! 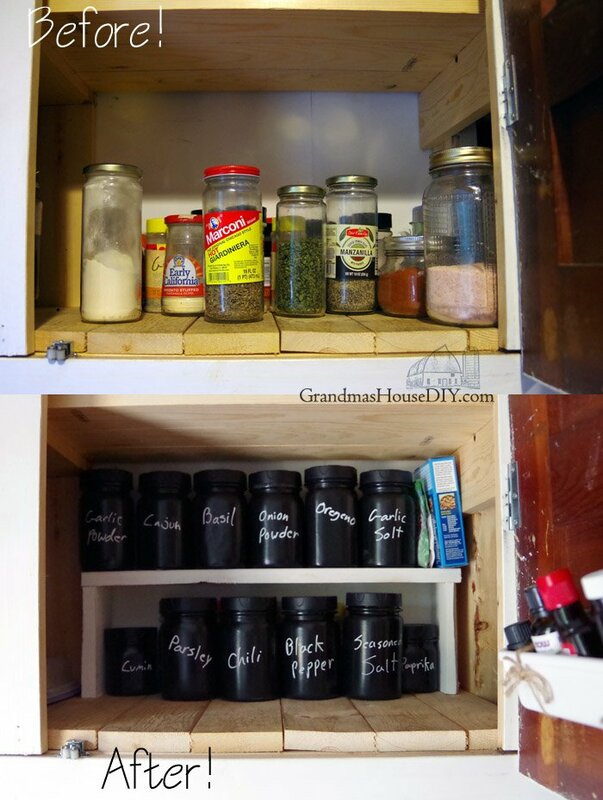 Great idea and darker is better with storing spices. I’ve only used spray chalk paint, pretty easy to use. I also use a rack in mine to elevate and add storage! Thanks Nancy, I’ll have to check into the spray chalkboard paint because this stuff was really weird to work with lol, but I think it turned out ok! Great idea Tarahlynn!! Anything chalk is a fabulous farmhouse touch! This is such a great idea! 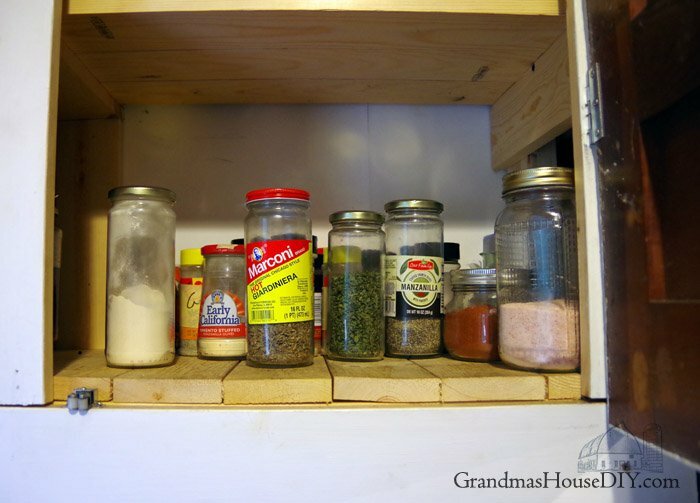 What a difference it makes and yes an organized spice rack can definitely make you happy! ? I thought you were talking about me with the old spice jars, lol. The new ones looks very nice. And it is so organized. Very nice. Looks great! Had to giggle at the notion of painting with ‘snot’. I’ve only ever used chalkboard spray paint, and will have to remember this if I ever try the brush-on version. Thanks so much for sharing at the #happynowlinkup! Thanks for coming by, reading and commenting Leslie! Great tips. Love your creative thoughts on this and for also sharing at DI&DI. I love these! 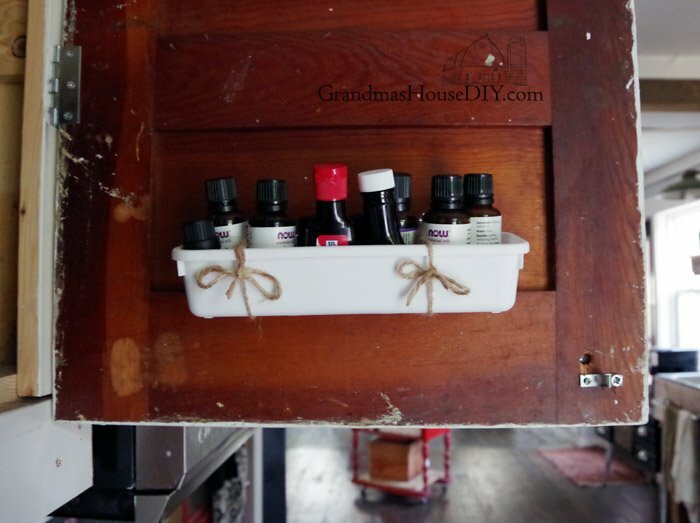 What a creative idea and they look great in your cabinet! Thank you for sharing them on Party in Your PJs. Pinned and shared! Thank you Sherry for coming by and commenting! How awesome! 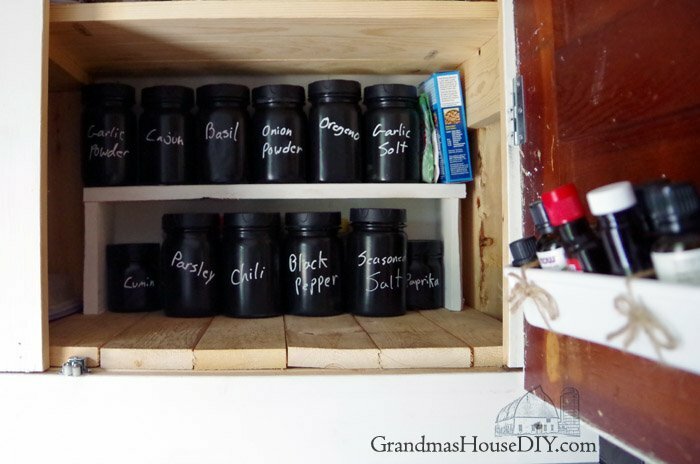 I just hopped by from Homestead Blog Hop to check out your Farmhouse Kitchen Project: Organizing Spices and I shared this wonderful post. I am constantly challenged on how to organize my kitchen efficiently! Such useful and inspiring ideas. 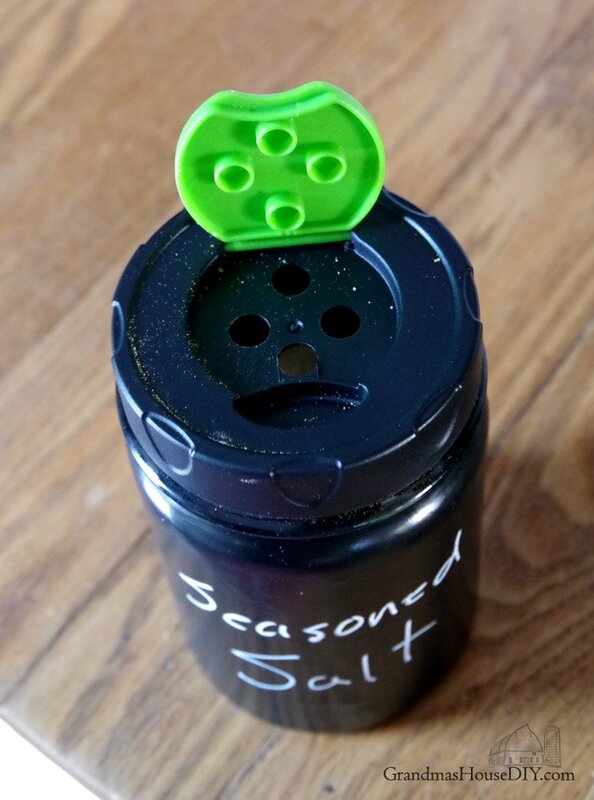 Thanks Deborah, this was such an easy fix for all of my spices and they’re still working great, Happy St Paddy’s day!